﻿ Felix the Cook — Small Biz Stories, Episode 14 » Red Mango Marketing! When Barbara Felix started her business, Felix the Cook, over ten years ago, she was looking for a way to provide for her family, while doing something she loved. Finding her sweet spot with custom-made sugar cookies, Barbara has attracted big name clients like Google Ventures, UPS, and The Four Seasons. How can your business do the same? Listen as Barbara shares her best secrets for attracting and delighting clients. Barbara: I’ve spent plenty of time working in offices thinking, “How can I get out of here?” I am not a paper person. I don’t care what industry it’s in, I cannot stand sitting behind a desk. So with cookies, I just love being the boss and being the creative person. I get physically ill if I cannot create something. Dave: Meet Barbara Felix, owner of Felix the Cook. Like so many businesses owners, Barbara became her own boss to avoid a boring, cookie-cutter career. Starting a business of her own, Barbara has the freedom to spend her days as she likes — which in her case means delighting customers with custom-made sugar cookies. If you’ve ever wondered if you have what it takes to start a business — or if you’ve already started and you’re wondering how to take things to the next level, listen up. Today, Barbara shares her secrets for how a one-woman operation can use customer relationships to land big-name clients like Google Ventures, UPS, and The Four Seasons. Dave: Many small businesses start with a combination of passion and necessity. When Barbara started her business over ten years ago, she was looking for a way to provide for her family, while doing something she loved. Listen as she describes her early attempts at finding the right fit and how an early mentor helped point her in the right direction. Barbara: Well, my dad was a cook. My dad always cooked at home. And I loved to play in the kitchen. I loved making things and my mother let me do whatever I want with butter, sugar and flour. So I have absolutely no fear of sweet stuff. And I grew up, got married, got divorced and decided I needed a career because I’ve been to high school, of course, but not much college. So there I was, a single mother with two children looking for something to do and I thought well, maybe I can take a cooking class and instead I decided to take the full program at the California Culinary Academy and do 16 months and come out as a chef. So I worked at a really fine restaurant for a couple years and then found it was just too difficult as a single mother to keep the hours of a kitchen, which were pretty brutal, and mind my kids. So I quit that and got into private chefing after a stint of making desserts for restaurants. There were a couple of small restaurants I worked for that didn’t have the time or the space to do their own pastry. So I’d do that for them. Again, pastry was always my favorite. And with the kids, I would make cookies with them every holiday like Halloween. I can’t get over it. That Halloween, I made black icing, my son was in heaven with black icing everywhere. So we’d do that and then one year one of my instructors was at the house for Christmas and she saw my cookies and she said, “Oh my God, Barbra, you have to sell these.” I said, “Really?” So because I trusted her, I pursued the cookies. I was private chefing at the time and I asked one of my clients what she thought. She suggested I get a year of cookies. So that was a great idea. So I designed 12 collections with 6 designs each to make up a dozen cookies for every month of the year, and got connected with a web designer, who started with that page, our cookies of the month. And from there it just grew. It was very word of mouth, very word of mouth. Dave: So, just talk us through kind of that inspiration for doing the cookies? Barbara: Oh! The inspiration was I can do this, and it’s fun and people pay me! That’s what it was. And that having someone whose opinion that I trusted told me they were wonderful. That’s what I needed because I get in my own little bubble where I can’t see outside. And if you go on cookies websites, it’s amazing what people are doing. They’re total artworks. And if you look at that, and then look at what I do and it’s like, well I’d never measure up. The funny thing is, is that they’re doing the same thing. Everybody is comparing, which is silly. But I wanted a way to make some money that wasn’t as difficult, as private chefing can be. I wanted to do something that I was entirely comfortable with, which is pastry. And it’s a fun job and it’s a happy job. People are so happy when they can get on my schedule. They are happy to order their cookies they’re anticipating, and they’re happy when they get them. So I like happy uplifting things. That’s why, I’m not curing cancer but I’m making people happy, nothing wrong with that. Dave: With cookie-making, Barbara found the sweet spot she was looking for. Now, she had to find something just as important — a loyal customer base. Luckily, this wasn’t Barbara’s first business. Through her past endeavors, Barbara already had some ideas about her target market, what they wanted, and how best to reach them. Barbara: Now, I spent some time in Texas for 10 years and I had my own business there as well, making curtains and drapery and shades. And my first customer was a junior-league lady and I had learned very well. You tell a junior league lady, you’re set because they all tell each other, they all call each other. So with that experience, with the cookies I thought, I got to donate to the junior league. And I did the same thing. I picked a couple different charities and I’d make a significant donation and people started calling. And that’s how it started, with donations, because I had to get the word out. Dave: Did you set any goals for your business when you were first getting started? Barbara: Oh, I wish I could say yes! I wish I could say I followed my business plan to the T. I did not. My goal was to make some extra money. I’m a single mother with two kids, money was the ticket. So, with the help of friends, I thought it was important to get a website together and that was my first goal to get all those 12 months of designs made. Then to set up a photography booth or some way to get…I bought my first camera to do the photographs, my first little instant camera. And, to set up a business account, I set up a checkbook. The goals were very small and then to find charities where I could donate because I knew that’s where my market was. See, I knew, from my experience of having my business in Texas, I knew what these ladies wanted. I knew what they were looking for and knew where they were. I knew my market. And I knew what they needed. And that’s how I did it. Going for the upscale charity events and contacting people I knew in that area. Dave: What would you say makes your business different from others out there? Barbara: I would say the service. I mean, they love the taste of the cookies, there’s that. They love the cookies, they love what I do. But I’ve had people tell me, “Oh, you’re so flexible, and thank you” And it’s personable, you know, people get excited when they can talk to the person who’s actually making their product. It’s not going through several layers. In fact, a few years ago, well in 2004, Gwyneth Paltrow put me on her Goop website for Christmas. And that’s because I knew her driver. A friend of mine drove for her. I didn’t even know he was driving for her but that was my connection. And I got a lot of orders and one person called to check on her order and it was so funny the way she spoke. It’s like, “Can you go down on the factory floor and find the order?” and I said, “Ma’am I’m making your cookies.” And they’re so excited. They’re very excited to talk to the person. So I think that’s it. There’s no filter between me and the client. They call or they email or they talk to me. And that’s the way I like it. And even as I grow, I don’t know that I’ll give away that part of the business. I think I’ll still be the contact person. Dave: Barbara’s success comes from giving her customers an experience they can’t get anywhere else. By listening to her customers’ advice, Barbara creates relationships that make other people feel invested in her success. It’s no surprise that many of Barbara’s best new customers have come directly from her existing customer base. Dave: Yeah. Is there, is there some place that you go for advice or guidance? Barbara: Oh gosh, yes! Gosh, yes! I guess I’m just a friendly person. But I know so many people who seem to be more successful than I am and their always eager to help me. I have one friend I met when I was doing cookies for a charity function and it was being held at Pixar. It was a very big deal and I got to see the Pixar office. I got to look at an Oscar, like two feet from my face, a real Oscar. That woman moved on to another company and another company and she’s taken me with her every step of the way. So I’ve made cookies for her at every company and she’s very into computers and marketing. And she helps me and she gives me ideas. Another friend of mine, again, it’s a friend of a friend. He asked me if I could deliver cookies to his friend who manages a very big jewelry store downtown. And because of the timing, I thought, “Oh I’ll just take him in myself.” And that was like a perfect thing to do. The fellow loved meeting me, he loved the cookies and he has sent me business and he has sent me a wonderful event planner that I work with constantly. And he’s my buddy. He brings me to different events, he suggests things to do. He’s got me working on a chocolate cookie now. He’s determined to have a chocolate cookie place card with gold lettering. So I have ordered. I have been through the web top to bottom looking for a specific edible gold luster, which I’ve acquired. It’s in the mail to me now. So they guide me, they tell me what you can do. Another friend of mine works at LinkedIn and he’s helping me use that to meet other marketing people in different companies because that’s where the cookie orders from companies come from. So, yes, I don’t know, people like me and they talk to me and I talk to them and we chit chat. And yes, I have plenty of advisors. I’ve made cookies for Google Ventures and they’re still customers. I did cookies for UPS. I did cookies for Tyler Florence a couple of times. And when he had his shop, my cookies were in his shop. Because one day, I walked in, and I happened to have my portfolio with me. Dave: Barbara’s confidence in her product and dedication to her customer relationships have served her well in growing her business and reaching big-name clients. But that doesn’t mean she’s always as busy as she’d like. Dave: Was there ever a time that you felt like potentially the business wasn’t gonna work? Barbara: Oh yeah! Oh gosh yes! Dave: Tell us about that. And I didn’t have the money to go up a notch. Packaging, when you start pricing packaging, you have to buy a lot for custom packaging. It’s a huge investment for a small business. And there were times where I would get discouraged. And then the phone would ring and somebody would say so and so told me about you. And I would get all happy again. I really feed off my customer’s happiness because it tells me I’m doing a good job. Dave: What have you found has been your most effective way to get or reaching customers? Barbara: Oh, really, Constant Contact because my email list consists of people who have already done business with me. They’ve already emailed me and bought purchased cookies so they’re on my list. Dave: Yeah. Tell me a little bit about your approach with email, like what do you? What do you send out? Like what do you do, how often? Barbara: I want to do it once a month. I try to do it once a month and I like to put up pictures of cookies they haven’t seen, something new. Like I believe I did an email about painted cookies now, there’s a big demand now for watercolor. You use the food coloring as the paint. So I did that. Mostly it’s seasonal, you know. It’s like, “Oh this is August, I’ll send out a picture of my watermelon cookies” or whatever. Trying to think of what they might be doing and what they might need them for. We’re very seasonal. I don’t ever have sales, so there’s nothing like that to do. I made a decision very early on that I wasn’t going to discount my work, at all. And I don’t. I don’t care if you’re buying two dozen or two thousand. The price is the price and that’s it. So, there’s no sales to advertise. It’s mostly a reminder. Get on the books now because September’s full. So, think about me now. Mostly to remind people to, order ahead. That’s what I use it for. The email marketing is entirely affordable, entirely affordable, $20 a month? I mean, come on. It’s a bargain. It’s a tremendous bargain. And what sold it for me is the online help because I’m of a certain age. I need to speak to someone. I don’t want to just tap on the computer. And every time I call, I get someone who is willing to stay there and help me and I’ve never gone away unsatisfied from a phone call. And I need that because I’m not computer savvy. I am not going to invest time in learning how to run a computer because I run a cookie business. I’m not a computer person. Dave: Rather than focusing on finding new customers, Barbara stays in touch with her existing customers — the people she already has established relationships with. By reaching out and reminding her customers what she has to offer, she sparks new interest and gets the phone ringing again. Dave: What is it that you would say that really keeps you going and your business successful? Barbara: Pride in what I do, that I do it myself, that I don’t have to answer to anyone except my customers. Like I’ve mentioned, this is not my first business. My first business was making curtains, draperies and shades and it was the similar thing. I worked alone, I made a beautiful product, everybody was happy at every stage. And I loved being my own boss. I’ve spent plenty of time working in offices thinking, “How can I get out of here?” I am not a paper person. I don’t care what industry it’s in, I cannot stand sitting behind a desk. So with cookies, I just love being the boss and being the creative person. I get physically ill if I cannot create something, if I can’t be refinishing furniture, or making a curtain or doing something creative. And the cookies give me all that. All my art, all my color, theory, everything I do is in there. And I love making people happy. I love making little kids smile when they get a cookie. I have pictures on my wall of the little kids holding my cookies, being happy. That’s a nice thing. Dave: You’ll notice Barbara’s success is rooted in her own satisfaction, as well as her customers’. As she said earlier, she really feeds off her customers’ happiness. While many small businesses are started by fiercely independent people — hungry to call the shots, make their own hours, and put their stamp on things — the successful ones never lose sight of the people they’re trying to help. I’ll leave you with Barbara’s best advice for someone interested in starting their own business. Barbara: Oh, golly. Know your market. If you don’t know where your market is and what they want, you have no chance. You need to know what people want. And once you figure that out, make what they need. It’s the same classic advice, find a need and fill it. And because of my exposure to a certain crowd of people years ago, I knew what they were looking for. I knew what they liked to have and that’s why I can still serve those people by making my product. You have to know your market, you can’t just have a good idea that nobody wants to buy, if you’re gonna do it for a living. I mean believe me, I love what I do, I love the art but make no mistake, and this is how I put gas in the car. I have to make money. 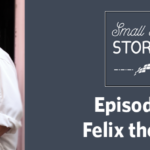 The post Felix the Cook — Small Biz Stories, Episode 14 appeared first on Constant Contact Blogs. This entry was posted on Thursday, May 18th, 2017 at 8:30 am	and is filed under Customer Success Stories, Email Marketing, News & Updates. You can follow any responses to this entry through the RSS 2.0 feed. Both comments and pings are currently closed.